I wasn't able to catch up with last week's Iraq-originated episodes of The Colbert Report until over the weekend, and I was curious what everyone else who saw the episodes thought. 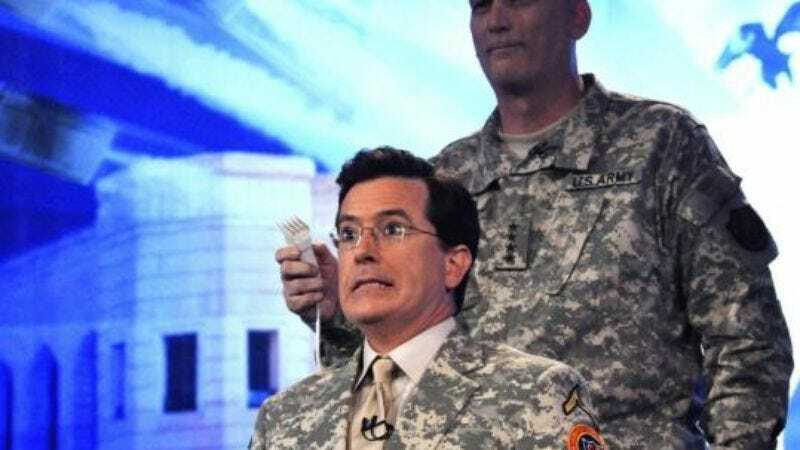 Myself, I had mixed feelings—not about Stephen Colbert entertaining the troops, which was a fine and noble thing, but about the tone of the episodes, which had a weirdly parodic air. I enjoyed Colbert's Christmas special, which was a part-parody/part-homage to the blatantly artificial, celeb-aggrandizing tone of '70s TV holiday fare. The special took place inside the world that the character of Stephen Colbert dwells in, where he's been a well-known television star for decades. But the USO shows at times seemed to originate from inside that same world—especially when politicians like Bill Clinton, Joe Biden and George W. Bush appeared via taped messages to thank our troops and take quick potshots at Colbert. They were treating him the way politicians used to treat Bob Hope, when they'd make fun of his golf game and his movie career as though everyone who'd ever been on TV for any reason were all part of one big community of pals. I thought Colbert had some funny segments last week, and some fairly daring ones (as when he mocked the "don't ask don't tell" rule in front of an audience of soldiers), but this winking "Everybody Hates Stephen" aspect of last week's episodes felt really off-kilter to me. The moments of sincere appreciation fit just fine, because The Colbert Report has always mixed genuine sentiment in with the satire. But the Hope riffs? Very weird, I thought. What say you?